On the morning of March 22, 1622, Virginia’s Powhatan Indian alliance executed a well-conceived and coordinated attack on English settlements spread more than fifty miles up and down the James River. Warriors from perhaps a dozen of the thirty-two affiliated tribes—Quiyoughcohannocks, Waraskoyacks, Weanocks, Appomatucks, Arrohatecks, and others—fell on men, women, and children in their homes and in their fields, burning houses and barns, killing livestock, mutilating the bodies of their victims. Planned by the Pamunkey headman Opechancanough, a kinsman of the deceased paramount chieftain Powhatan, the offensive slew about 350 whites, a sixth of the total in the fifteen-year-old colony. From modern Richmond to Hampton Roads, the onslaught devastated Jamestown’s outlying plantations, but it failed in its purpose: stopping the relentless encroachment of the English. The raid is commonly—and erroneously—called the Good Friday Massacre. More than one historian has suggested that the attacks were timed to coincide with the Christian Holy Week, thinking that the 1622 raid was on Good Friday. Eminent colonist George Thorpe had often conferred with Opechancanough on matters of religion, trying to convert the old chief to Christianity, and presumably would have shared with him the details of Easter and the resurrection. The Powhatans had a predilection for blending irony and warfare (These are Indians who killed colonists for stealing corn by stuffing corn down their throats, for example.) It is suggested that Opechancanough planned the attack for Good Friday to emphasize a rejection of the foreigner’s religion. Easter, however, does not cooperate with this theory, falling as it does on April 21 in 1622, several weeks after the massacre. So how did the myth begin? Memorable and catchy, the mistake persists in textbooks and on Internet sites despite the efforts of historians to correct it. Historians used to be taught to evaluate evidence, to question everything, but that is rarely the case today, as the most enduring old myth about Jamestown reveals. The “Good Friday Fallacy” associated with the 1622 Massacre originated 136 years ago and was still misleading the general public as recently as the May 7 issue of Time magazine and the January 2007 special Jamestown issue of U.S. News & World Report. 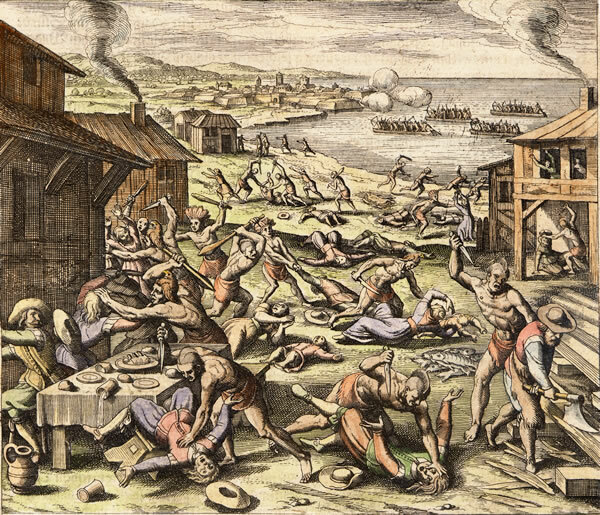 Good Friday fell on April 19 in both the 1622 and 1644 years of massive Powhatan offensives, and that led to the creation of the myth–unforgivably by a clergyman. In 1871 the Rev. Edward D. Neill got his massacres mixed up; thought the 1644 attack occurred on Good Friday, rather than on Maundy Thursday; and then inadvertently reversed the years! A Neill admirer, Dr. Lyon G. Tyler, embraced the symbolism of heathens slaying Anglicans on that special day of Christian sacrifice. A careless slip became an enduring myth because both men were popular celebrity authors, more prolific than careful, with Neill restating his error in multiple, repetitious books from 1871-1885, while Tyler did likewise from 1904-1915. The indifference paid to or paid by copyeditors and proofreaders is even more telling in the publication industry today, as the Good Friday Fallacy is more widely disseminated than ever before. At least three Oxford University Press books perpetuate that error–including the 25th anniversary edition of T. H. Breen and Stephen Innes’s popular “Myne Owne Ground”: Race and Freedom on Virginia’s Eastern Shore, 1640-1676–while notable scholars, such as Breen, John Murrin, and Jill Lepore, keep it alive in their college textbooks. Such errors also live on in cyberspace, where “history viruses” proliferate like all the others. They have “infected” the Jamestowne.org website, which has an entire section under a prominent heading, “Good Friday Massacre,” as well as the 2005 online book by the National Park Service, A Study of Virginia Indians and Jamestown: The First Century.